New members and potential members of all fitness levels and abilities are welcome at all of these events. The full diary of club featured events is on the club website at: http://www.barunner.org.uk/Event Diary.shtml (updated 5Dec17). Not for you, no longer interested? remove me please. / Difficulty viewing this? Read it from the website:- http://www.barunner.org.uk/News Latest.shtml. Inclusions, with photos, please to Roderick Hoffman at news@barunner.org.uk. Five participants for the last Dream Mile of the year with Ian Cunningham leading the group home and Steve Newell taking it easy at the back whilst checking out the route for the Xmas relay event. The weather was dry though earlier rain had left significant puddles underfoot. At the end we shared seasonal mince pies and mulled wine courtesy of Neil Frediani and Roderick Hoffman. Vegetarian rolls, sausage rolls, cocktail sausages, meat & veg samosas, quiche, sandwiches (including Xmas turkey), gala pie, meat and veg spring rolls and afterwards mince pies and Christmas pudding. We've asked for four portions to be gluten free. There will be a Secret Santa! This is optional, but please bring a wrapped present of value about £5, suitable for a family audience. At the beginning of the evening everyone with a present can add it to the sack. Later we'll take it in turns to pull a present from the sack - hopefully different from the one you put in! Obviously to pull a present out you must first have put a present in. The traditional in-house pre-Christmas mile relay event is moving this year from the Parkway in Cranford to the A4 near Harmondsworth / Longford. The gathering point/start/finish will be Bath Road, Longford opposite the Premier Inn (UB7 0EA). The course will be an out-and-back run (keep left) along the pavement using the western half of the established Dream Mile. The turnaround point will be on the Westbound A4 pavement opposite the Compass Centre/Arora Hotel - roughly alongside the Atlas Statue. Those without Waterside parking permits should consider parking near the Five Bells in Harmondsworth and warming up with a jog from there. It is also possible to park alongside the start point, without charge FROM 17:00. Those wishing to run in the relay should send an estimate of their time for a flat mile to Steve who will select the teams to produce a close race. The next winter handicap run will be on for Wednesday 13th December at Cranford. Meet in the car park of Cranford Community College around 17:30 if you need to get changed or around 18:00 if arriving ready changed. The course is shown on the club map. It starts from near the zebra crossing close to the Queen's Head. Start times will depend on previous times run with the objective that you should finish the accurately measured five mile run around 19:00. Changing rooms are available in the college afterwards although we have been advised that the showers may not be working. After the run and a towel down we'll meet in the Queen's Head where a 15% discount is offered to anyone with the current BA Clubs membership card. The chilly weather (or possibly the office party season, or even rumours of fresh snow in the Alps) caused a severe dip in UK attendances this weekend. There were (a record) 95 cancellations and runner numbers were down into the 60,000s for the first time since last November. Ed: The 392 events held is still more events than were held in the UK in any week prior to April 2016. Worldwide the UK fall resulted, for the first time, with more parkrunners running outside the UK than in the UK. Julie Barclay has been in good form of late under the ever watchful of her coach Tom Rowley. This week she ran at Guildford where Alastair Heslop was putting in a volunteer shift as barcode scanner. It was her first run there for over three years and her time of 21:41 (81.32%) was a course pb and new club female course record. Barry Walters holds the best overall club time with 19:39. At Richmond Park there was a chance meeting of Steve Newell (36:42) and former member Bill Byrne (21:48). Richmond was one of the early parkruns as the movement spread out from Bushy Park and is now over ten years old. The course has never changed and the start ”funnel” and the path along several stretches of the course is quite narrow. The slowest runners (40 minutes) who seed themselves correctly at the back need to allow half a minute to reach the start line. Those familiar with the route will know that the course is not a flat one. A challenge – and fast runners should certainly give it a go. Bob Bannister (25:46), David Duggan (28:02) and Anne Bannister (28:48) travelled to Frimley Lodge for the first time. Nineteen of us have now run there at least once. As with Guildford the club records are held by Barry Walters (19:04) and Julie Barclay (22:28). The next club featured parkrun will be at Northala Fields on Saturday 20th January. The club course records are held by Richard Ruffell (20:27) and Alice Banks (25:58). Currently there are thirteen members of the parkrun 500 club, with two new members this week, and most of them continue to add to their score every week. Alan Anderson didn’t run this week but he is one of five runners likely to reach the 500 run milestone sometime between Christmas and Easter. His current score of 485 is just three better than that of former member David Tyas who is a regular at Bushy Park. We’ll be tracking their progress over the coming weeks with the aim of having a club featured parkrun on the day of Alan's 500th (at Gunnersbury). Another two parkruns have been confirmed for Germany, and both should be easier to tourist to than any of the first three. These are in Frankfurt (http://www.parkrun.com.de/nidda/) and Berlin (http://www.parkrun.com.de/hasenheide/). Both start on 6th January. Petra Otto has already committed to be at the Berlin inaugural and is keen for me and anyone else to join her there. The BA Athletics Club is a non-profit making organisation with an aim of breaking even each year. This enables us to be generous towards charities with some events deliberately raising funds for good causes - such as The Concorde Five raising funds for the British Heart Foundation and the Annual Quiz raising funds for the White Lodge Centre. We are also able to make some direct donations - for instance the funds raised earlier this year from selling off surplus equipment we no longer had anywhere to store. 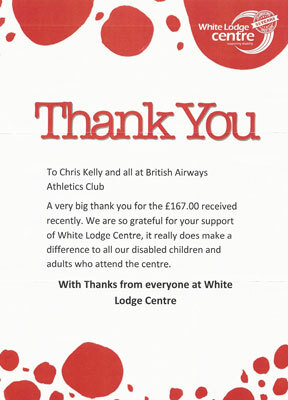 A very big thank you for the £167.00 received recently. We are so grateful for your support of White Lodge Centre, it really does make a difference to all our disabled children and adults who attend the centre. 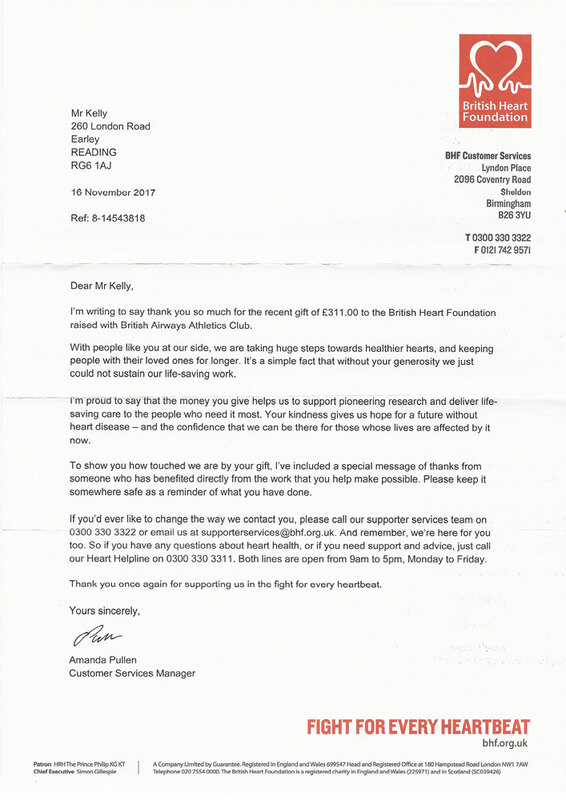 I'm writing to say thank you so much for the recent gift of £311.00 to the British Heart Foundation raised with British Airways Athletics Club. With people like you at our side, we are taking huge steps towards healthier hearts, and keeping people with their loved ones for longer. It's a simple fact that without your generosity we just could not sustain our life-saving work. I'm-proud to say that the money you give helps us to support pioneering research and deliver life-saving care to the people who need it most. Your kindness gives us hope for a future without heart disease - and the confidence that we can be there for those whose lives are affected by it now. And remember, we're here for you too. So if you have any questions about heart health, or if you need support and advice, just call our Heart Helpline on 0300 330 3311. Both lines are open from 9am to 5pm, Monday to Friday. Thank you once again for supporting us in the fight for every heartbeat. Just to let you know I run a cross country route once a week in Cox Green in Maidenhead (with the parkrun course a small part). I have been doing this once a week for the past six months. The conditions yesterday were tres-muddy and based on my op. last January recovery, the time was 36.46min. I average 33 mins so not so bad. She won't have it but Trish has inspired me, The distance is a 'vague' three miles as I don't have an 'ometer but I must get fit for the 'mad March' marshall job and the London main and Cycle. I also cycle a ten miler when time permits. Results, news, pictures, feedback, jokes, stories - send it to the editor, Roderick Hoffman, at news@barunner.org.uk.